Jan. 9, Pine Avenue and Tarpon Street, drug arrest. Manatee County sheriff’s deputies pulled over a vehicle and arrested a juvenile for misdemeanor marijuana possession and paraphernalia after observing the vehicle had stopped at an intersection for a long time. Jan. 13, 200 block of Pine, runaway. A habitual runaway, whose parents live in Anna Maria, showed up at the sheriff’s substation. Deputies determined she was staying at a friend’s house and the runaway’s father was working with a specialized law enforcement team about the continuing problem. The deputy left a message with the friend’s mother to ensure the runaway was living there. Jan. 22, Gulf Drive and Willow Avenue, Baker Act. Deputies stopped a vehicle after observing it without its headlights on after dark. The woman was incoherent and EMS was summoned. She was taken to Blake Medical Center in Bradenton under the Baker Act. Jan. 16, Island Time Bar and Grill, 111 Gulf Drive S., warrant. Bradenton Beach police arrested a 37-year-old man on two warrants for violating his probation. He was taken into custody and transported to the Manatee County jail. Jan. 18, Coquina Boat Ramp, 2651 Gulf Drive, stolen boat. MCSO advised a BBPD officer of a stolen boat in the city jurisdiction. 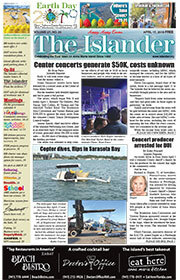 The officer contacted the Tampa owner, who declined to retrieve the boat due to the boat’s condition. The boat was towed. Jan. 19, Wicked Cantina, 101 Seventh St. N., defrauding an innkeeper/trespass. A 40-year-old man was arrested after a manager reported a customer becoming belligerent with employees and refusing to pay a $5.30 bill. He cursed at the server and said he was broke. The man later apologized to police, saying he found out earlier his girlfriend of 15 years had cheated on him and he’d gone out drinking. Jan. 11, 3700 block of 117th Street West, domestic disturbance. Two sisters argued and 911 was called. Manatee County sheriff’s deputies observed no injuries and determined no physical violence occurred. Jan. 12, Dunkin Donuts, 3302 E. Bay Drive, information. Holmes Beach police responded to a clerk’s report of a female customer’s husband making threats after the clerk waited on the woman. The clerk admitted she hadn’t initially seen the woman at the counter. The clerk told police she apologized for making the woman wait and that she made an offensive remark about the woman’s height. The female customer apparently complained about her coffee being cold and left. Her husband then entered the store, yelled and threatened the staff, who told police they feared the man would return and cause them harm. The workers were advised to call the police if the couple returned or if they encountered an irate customer. Jan. 15, 3000 block of Gulf Drive, drug arrest. A 29-year-old man was arrested for misdemeanor marijuana and paraphernalia possession after a Holmes Beach police officer pulled him over for speeding and noticed the odor of marijuana. The officer found 15 grams of marijuana, a rubber case containing .06 grams of THC resin, two bongs, a marijuana pipe, three packs of rolling papers and a cannabis shredder.